I ended up killing a bird on Saturday, after messing up with my 28 ga M37 on a perfect set up. I actually somehow squeezed off a shot before I intended. Shot clean over his head without even getting down on him. Still not exactly sure what happened, but unfamiliarity with the trigger combined with carelessness, in short. Took my .410 loaded with the 370NM shell dupexed with 9x10s out this morning. This one flew right to me off the roost. Very memorable hunt. Congratulations Hal. 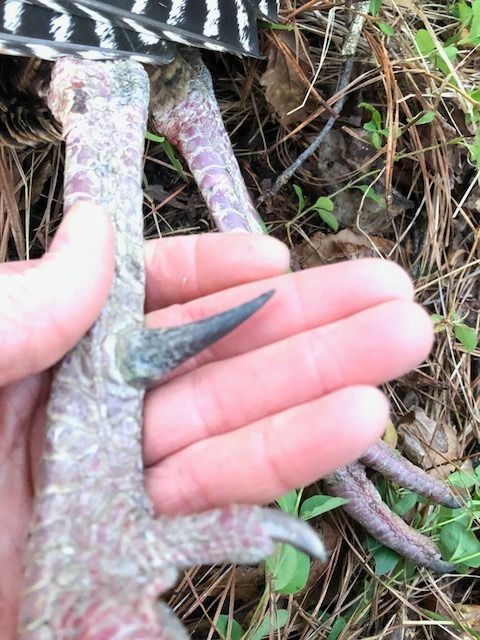 Beautiful bird and nice spurs! 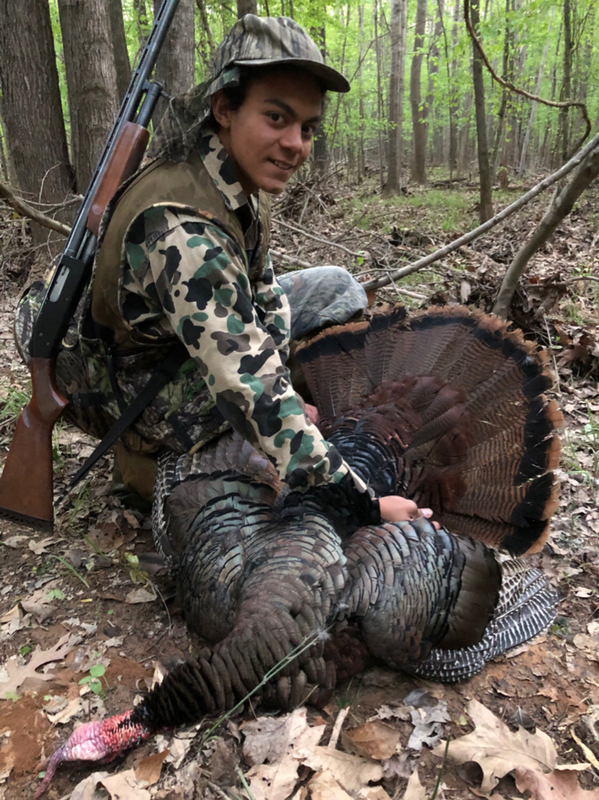 That’s awesome-congrats on a successful hunt. 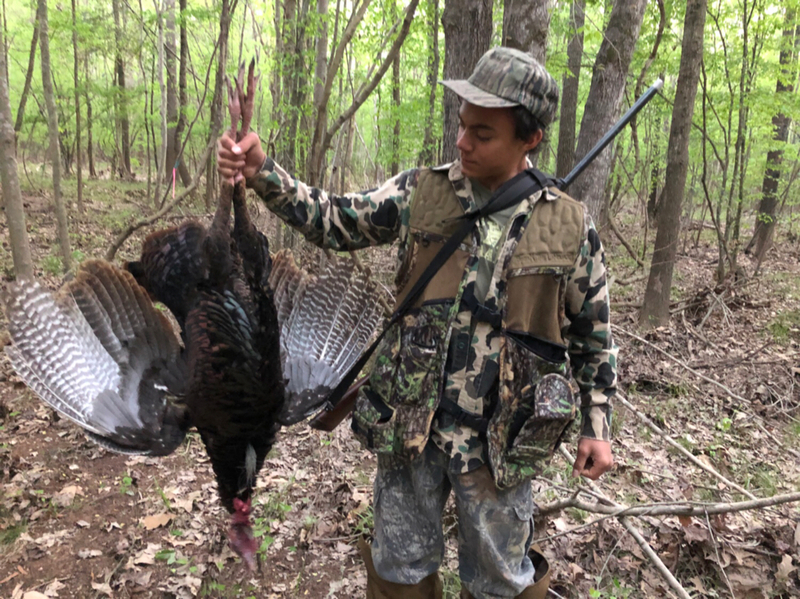 It is hard to believe that my 2018 North Carolina spring gobbler season is history. It’s crazy how you wait for that all year, and then it goes by so quickly. 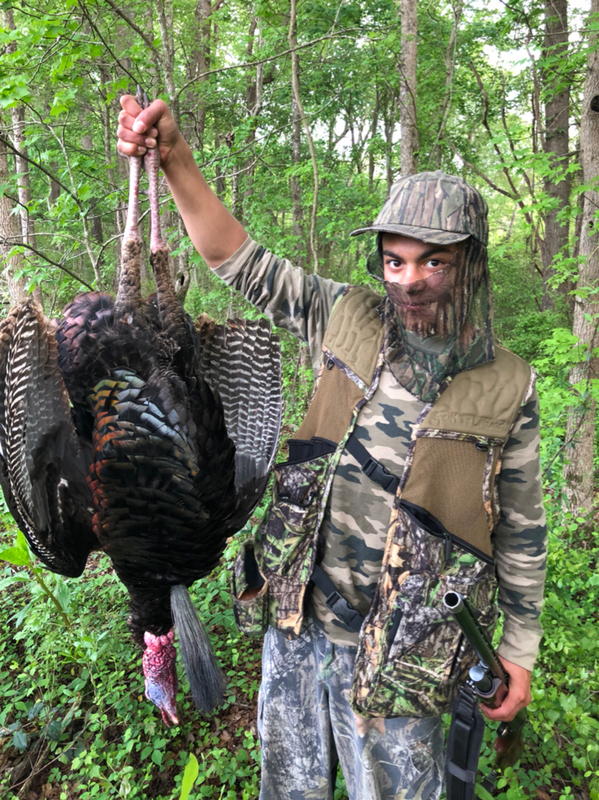 I took my nine-year-old grandson Jesus out for his first ever hunting trip. 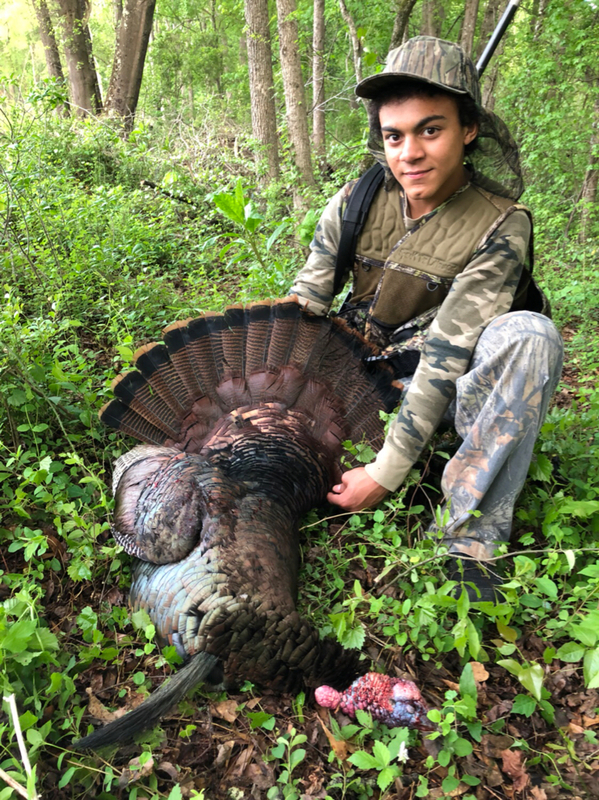 We got to roost a gobbler the evening before, and I had high hopes that we could get him to come in off of the roost early in the morning before the rain set in. I knew he had a lot of hens with him, and so my plan was to find a way in that would hopefully allow us to get close to him where he could fly down and come to us first. So the next morning we came in from a direction that would avoid contact with hens, or so we hoped. We got in tight and were in good shape - and he gobbled good. We heard a few hens close by and the gobbler flew down and slowly worked our way. Some of the nearby hens got with him but they were all coming our way. At one point we caught glimpses of him coming through the bushes - in range- and could hear him drumming as he strutted for the hens. 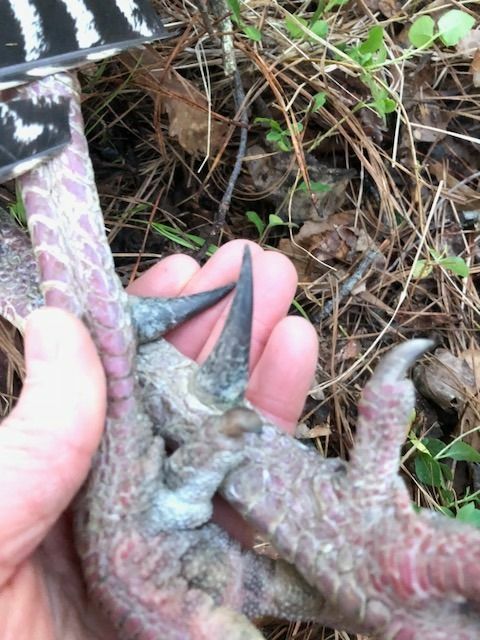 But right before he could get out from behind the bushes into a clear shooting lane, a hen that we did not know was there flew down out of the tree about 40 yards away. She had been looking at us the whole time, but never putted or never made a sound. But since she knew we were there, she flew down and apparently led the whole group away from us. We tried to flank them a couple times, but Jesus quickly got tired of that, and wanted to Get out of the rain and ride around instead of hunt any longer. So, that ended day one. After an unspeakable mishap north of the border, my 2018 North Carolina season officially began at 10 AM when I signed into the logbook at the old club house. I went To my favorite midday location, and decided to sit down and cold call for as long as it took to either get a turkey, or give up and go home. After about an hour into my calling routine, I was answered by a hen not too far away. I couldn’t really hear her all that well because the wind had picked up and was blowing pretty hard. But I started trying to work on her. I hoped that there might be a gobbler in tow. She would call back to me very aggressively every now and then, cutting and yelping and making all kinds of racket. But she didn’t seem to want to come to me. I was not in a location where I could easily move, so I stayed put and tried to convince her to head my way. I tried calling real sweet, I tried calling real aggressively, but she wouldn’t budge. I tried mimicking her, but she wouldn’t budge. So I gave her the silent treatment. She wouldn’t budge on that either. At one point she had begun to ease my way, and got to about 60 yards. This time when I called to her, I got a subdued afternoon gobble in response. So now I knew she had a tom with her. But then she went quiet again, and I lost audible contact shortly after that. This went on for a couple hours when it finally sounded like she was moving some - over towards my left. Over about the next hour it sounded like she progressively kept going to my left and even went out into a nearby field. But try as I might, I could not see her out there. So, I decided to scoot closer towards the field, very slowly and carefully, to see if I could get a better vantage point of what was in the field. I continued my calling routine as I did this. Not too long after that it sounded like the hen had actually gone past me in the field, though I still hadn’t seen anything out there. Then all of a sudden, I thought I heard drumming. Try as I might I couldn’t see anything, and wasn’t sure that I actually heard drumming, with all the wind noise. Then a few minutes later, in response to another of my calls, I heard drumming again - closer - and it was unmistakable. So i peered through the bushes at the edge of the field and saw turkey coming down the edge of the field closer to me. When the turkey reached an opening and showed me his profile, I saw a beard. Then a second turkey with a beard showed up right behind him and stuck his neck up looking towards me where I had been calling from. So I put the bead on his head and let the 28 horses go. As it turns out, there were three toms with that hen, and they had gone by me with the hen, then turned around to come back to me after I had scooted a little bit closer to the edge of the field and called from there. The pictures of that bird are in the OP. I planned to do a before-work flash hunt on the first Tuesday of the season. This was a new place I had never hunted before, but I knew there were turkeys in the area. I had scouted a month earlier, and had been thinking about how I would make my approach early in the morning. I decided to get there extra early so that I could walk along the edge of a field without getting seen by Turkeys that possibly could be roosting not too far off the edge of the field. So I got to my predetermined location in the dark and found a place where I could stand in a little bit of cover and watch what was going on, and move as needed if I heard something on the roost. When it came time for gobbling to start, a bird gobbled right on the edge of the field about 70 yards to my left. It was so close, since I was also on the edge of the field, that I was afraid to move at all, even to sit down - in fear that I might get seen by that turkey. As I was thinking about that, all of a sudden another turkey gobbled about 40 yards behind me - about blowing my hat off. I had inadvertently positioned myself very well, right in the middle of two roosting, gobbling Turkeys. When the bird to my left gobbled again, and the bird behind me gobbled again, I elected to slowly sit down and face the closest bird that was behind me in the woods since I thought I could do so without being seen. If the one on the edge of the field flew down first, I would be in an awkward position, but at least I’d be able to watch him and adjust my movements accordingly, to get a gun over on him. Then another turkey gobbled and another and another. There were at least four maybe five or six gobblers-I don’t know. 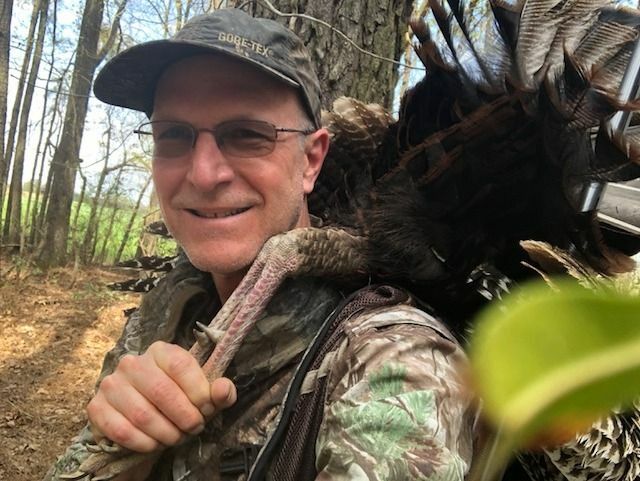 I looked and now could see the closest gobbler standing up on a limb and strutting and gobbling at the hens that began making noise as they began to fly down about 80 or 100 yds away. Then I saw a second gobbler further back in the woods - also strutting and gobbling in the tree at the hens. It was crazy, and I was right in the middle of it. Well, now I knew that I had to get serious with the competition, or my hunt might be over. So I began calling softly, immediately after the turkeys would gobble. After a couple minutes of that, I saw a turkey fly down quartering towards me landing below the lip that dropped into the bottom. So I got my gun pointed in that direction in case it was a Tom that might come up over the lip to me. I called some more and then I saw a second turkey sailing through the trees headed my way- Right towards me actually. I could tell it was a male bird as it was flying towards me, because I could see the white top of his head. It kept coming and landed about 10 steps from me at 1 o’clock - And immediately went into strut. I shifted my .410 over on his head - he stuck his head up - and I let the little gun squeak. That bird turned out to be the longest spurred bird I’ve ever killed with 1 7/16 inch and 1 5/8 inch spurs. And I wasn’t even late for work. 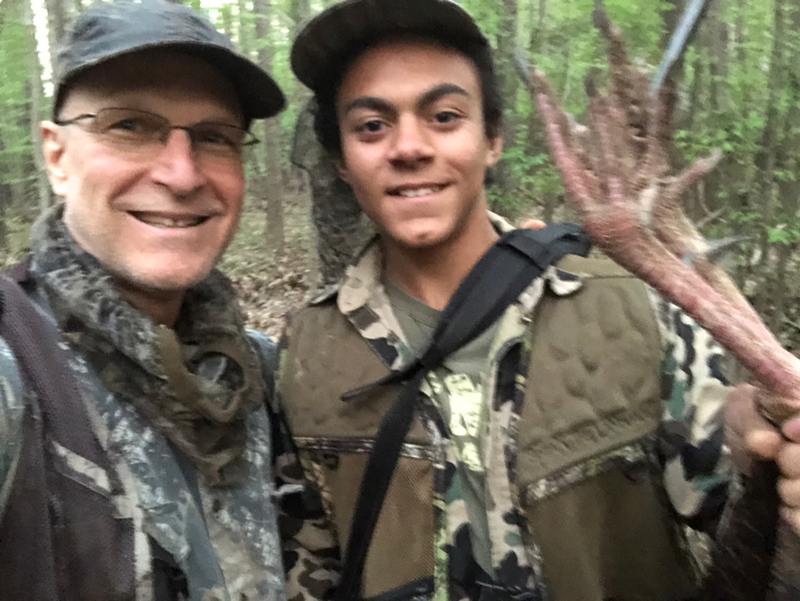 On Friday the 20th, I picked my oldest grandson Trevor up after school and we took off for an afternoon hunt. We were going to a place where I had killed a turkey last year, and had scouted the previous week. Both times Turkeys had roosted off the property but then moved back through our property. So I figured we would try to sneak in and get positioned in a direction between where I hoped they might be, and where I hoped they might be heading. And we were going to just sit and call till either we killed a turkey, or legal shooting time ended. I did not call at all until we got set up in a good location and we’re settled in for the long-haul. Trevor dozed off a few times as we called for the next three hours, and he got some calling practice in. Needless to say, I was very excited as he pointed two gobblers out to me, coming through the swampy area we were in. I called softly again, and they adjusted their approach slightly and headed straight for us. We had gone over and over the scenario-including how to aim the gun, and what it meant when I told him that it was OK to shoot. 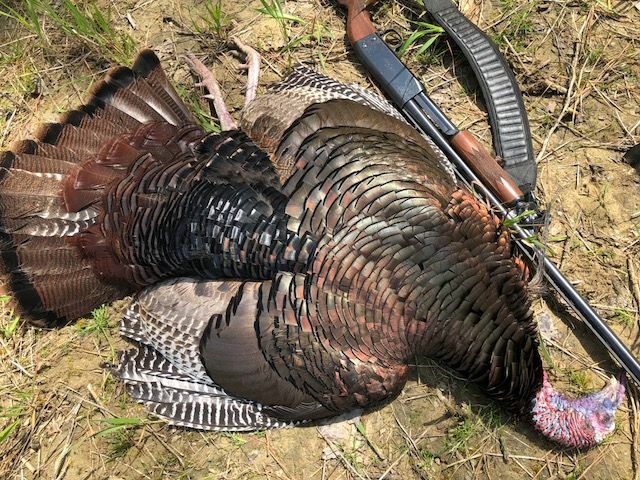 He was aiming the gun, and I called again to get the gobblers to stretch their head up and stay still so he could get a shot. But he didn’t shoot. So I told him to shoot again. And then I said it again. 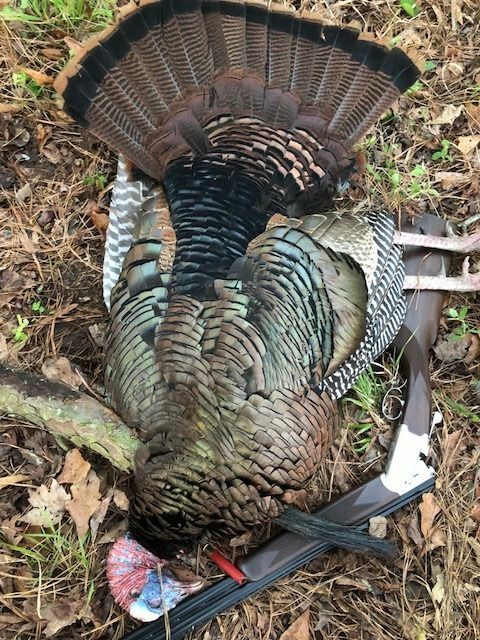 Finally, the gun went off, and I saw the turkey’s fan flop down. But it never moved again - he slammed it with that 2 once load of TSS. I picked up Trevor again for another afterschool Turkey hunt. We decided to try another area that we had never hunted before. We slipped around through the woods quietly to avoid any contact from birds that might be out in a nearby field. I had scouted that field the morning before and had seen turkeys in it. Our plan was to approach the field Without being seen, stay in the woods, and try to call any turkeys in that might be out there. We stayed put and waited in a patch of poison ivy, staying low, and with me trying to explain to Trevor how good a turkey’s eyesight is. He seemed to enjoy using his ninja skills, and the fact that turkeys were within sight, that seemed to keep him alert. After what seemed like forever, the turkeys moved far enough away so that Trevor could sit down on the tree in front of us, and so that I could stand up behind the trees to watch the Turkeys the whole time. I didn’t want to call any, until they were far enough away that they couldn’t see where we were calling from. And also at a time when the hens were further away from us than the Toms were. By the time that moment came, one of the Tom’s had disappeared somewhere - so now there were three in the field. Trevor had dozed off a couple times while we waited. I began calling and immediately the three toms which of been alternately sitting down, standing up, and preening their feathers - started strutting. And Trevor woke up. One of the turkey’s head began to turn white, and I knew that he was getting excited when he heard my soft calls. I watched him the whole time, as he alternately strutted towards us slowly, and then back over towards the hens. Every time he would start easing back towards his female companions, I would call again, and he would turn back our way and start coming towards us once again. As this was going on, I could tell Trevor was getting excited. I didn’t even need me to tell him to carefully get his gun pointed in that direction. As the Tom approached he was quartering to our right, making it harder for Trevor to get the gun on him. But Trevor did a good job slowly shifting around without the turkey seeing him. When the turkey got into range I told Trevor to shoot anytime he could. At that point Trevor moved his gun one last time, and the turkey saw the movement. He stretched his head out horizontally trying to get a better look at what made the movement that he saw. At that point I told Trevor that he better shoot quickly if he has a clear shot. I didn’t need to say that but once this time, and Trevor let the 2 ounces of TSS go once again. Congratulations Hal. 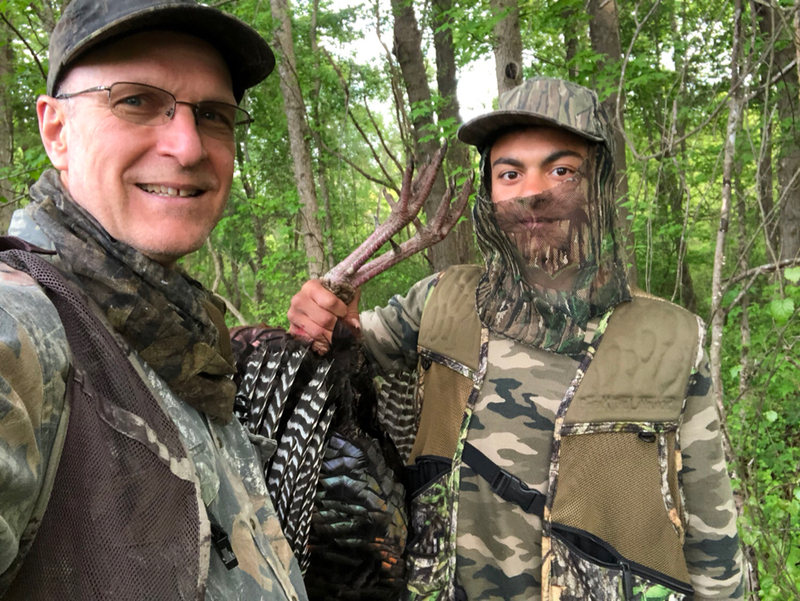 It looks like you and your grandson had a great hunt and good time spent together. We had a good time but it was a tough season. The birds just weren’t talking/working in Northeast MO on the five days I was able to hunt. We had snow the day before opener and the first 2 days of season it was 23F at first light with high winds. I was able to get my 79 year old father out. We setup a tent and I brought a heater for him. He has had health problems and hasn’t hunted in several years. He commented he had a really good time. We had a group of 4 jakes come in but gave them a pass. As you said, I can’t believe it’s over.